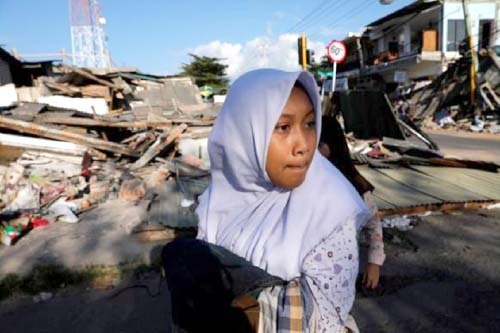 On Sunday, July 29, the island of Lombok in Indonesia was violently struck by a 6.4 magnitude earthquake, leaving at least 17 people dead and hundreds more injured. The disaster was followed by 66 aftershocks with a maximum recorded magnitude of 5.7. Thousands of homes have been either damaged or completely flattened, leaving families with nothing. But the disaster did not stop there. Less than a week after the initial quake, an even more devastating 7.0 magnitude earthquake hit the island. A tsunami alert was issued but lifted shortly after. A number of aftershocks have continued to rock the island, spreading terror and panic to local families and tourists. The aftershocks have been felt in neighboring islands Bali, Jember and Sidoarjo. This devastating quake has killed nearly 100 people so far. At least 20,000 men, women and children have been left homeless and urgently need shelter. The situation is still unfolding but we’re sending an assessment team to find out if and how we can help. There have been two significant earthquakes in Indonesia in the last week, along with several aftershocks. On Sunday, July 29, the island of Lombok was violently struck by a 6.4 magnitude earthquake which was followed by magnitude 7.0 earthquake on August 5th. The epicenter was in the area of West Nusa Tenggara Province. The earthquake was felt on the islands of Lombok, Bali and Sumbawa. At least 91 people are confirmed to have died, with most reported to have been killed by falling buildings. Thousands of people have been displaced, with initial reports say that around 3,000 homes are destroyed. These facts are likely to change because the power and mobile phone networks across the affected islands are damaged, meaning that reporting is difficult. We are sending an assessment team to Lombok. Two ShelterBox Response Team volunteers will be there by the weekend. The team will be working with local Rotary contacts and liaising with local authorities to understand how we can help. We have been talking with a Past District Governor who has worked with ShelterBox previously. We have stock in the region which we can use to help families if it is needed. There have been aftershocks happening across the region and we will be monitoring the impact of those. ShelterBox has responded to disasters in Indonesia, including earthquakes, 11 different times.